Prof. Conor Walsh (left) and Dr. Panagiotis Polygerinos (right) discuss a soft robotic glove designed for hand rehabilitation. Photo credit: Kirstin Hagelskjær Petersen. 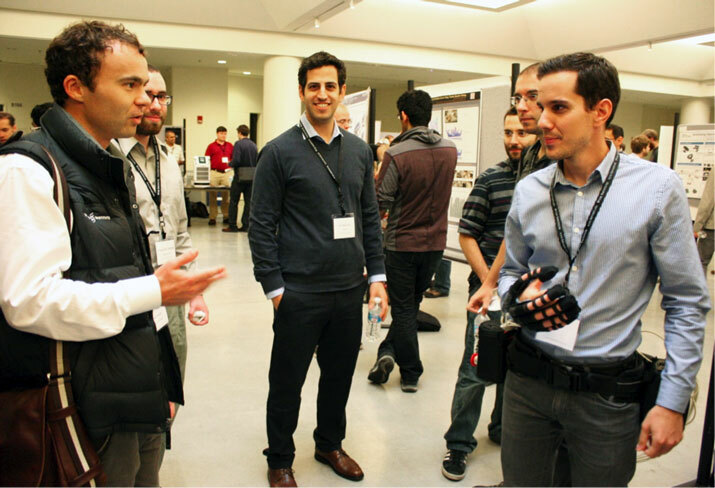 The 2nd annual Northeast Robotics Colloquium (NERC 2013) was held at Harvard University on Sunday October 6th, and this year saw the event grow in size and scope, with over 200 attendees from 18 different companies and 20 different universities across the northeastern United States. The one-day event comprised a program packed with exciting presentations from four of the world’s leading roboticists and researchers, as well as industry exhibits, poster presentations, and live robot demonstrations. The overcast Cambridge weather and early Sunday morning start led to a rush on the tea and coffee cart, but the mood was quickly lifted by an energetic and engaging keynote address by Prof. John Leonard. John Leonard has been at the forefront of research on robotic navigation since coining the phrase Simultaneous Map Building and Localization (now referred to as SLAM) while a graduate researcher at Oxford University, and remains so in his current role as Professor of Mechanical and Ocean Engineering at MIT and a member of CSAIL. His talk tracked the development of SLAM systems, from the birth of the field over a quarter of a century ago to the soon-to-be ubiquitous self-driving cars of tomorrow. In one of the many lighter moments of his presentation, Prof. Leonard presented video evidence of one of the first ever recorded collisions between two full-size autonomous vehicles, which occurred at the 2007 DARPA Urban Challenge, before admitting to being partially responsible for the blunder. The fast pace of the morning continued with a 15-minute spotlight presentation on one of the colloquium’s Gold Sponsors, Jaybridge Robotics, followed by the first interactive session of the program, which included poster presentations, live robot demonstrations and industry exhibits. 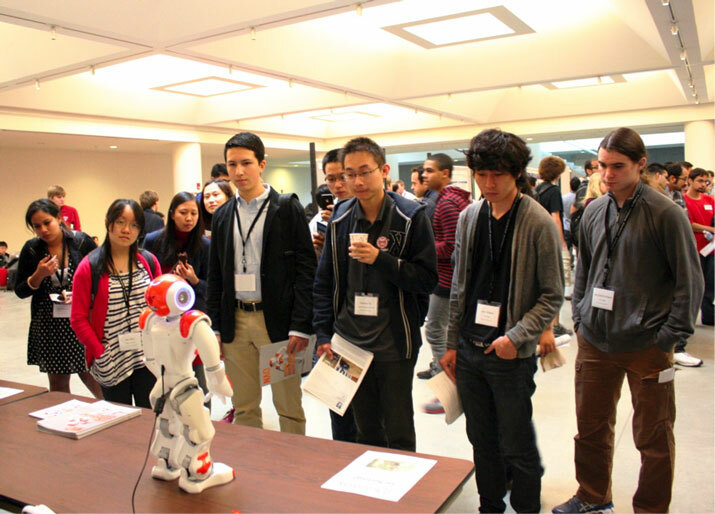 Notable robotic participants included NAO from Aldebaran Robotics, a trundling robotic avatar from Roger Williams University, and a soft robotic glove from Harvard University. The very personable NAO from Aldebaran Robotics entertains a crowd. Photo credit: Kirstin Hagelskjær Petersen. The next keynote presentation was given by Prof. Conor Walsh from the Harvard School of Engineering and Applied Sciences and the Wyss Institute. As the founder of Harvard’s Biodesign Lab, Prof. Walsh specializes in developing new smart robotic devices that are specifically intended for interacting and cooperating with humans, and then translating them to usable products for industrial partners. In his presentation, Prof. Walsh unveiled some of his most recent work on soft wearable exoskeletons, including a new must-have for every roboticist’s wardrobe – the “fancy pants” for assisted locomotion. Following a break for lunch and more socializing, Dr. Marc Raibert gave a highly anticipated keynote address on the most recent developments on dynamic legged robots at Boston Dynamics. As the CTO and founder of Boston Dynamics, and as the founder of the Leg Lab at CMU (and then MIT) prior to that, Marc Raibert has been personally associated with the state of the art in advanced dynamic control systems and high-performance mechanical design for much of his career. During his keynote address, Marc talked about pushing the limits of mobility, speed, and dexterity with dynamic legged robots, and presented a status report on several of the robots currently under development at Boston Dynamic. His presentation included a number of videos, some of which had not been shown publicly, many of which documented surprising experimental results (not failures! ), and all of which were thoroughly entertaining. The second 15 min sponsor spotlight focused on the Wyss Institute for biologically inspired engineering, and was followed by the final interactive session for the day, during which more robots were on show, including a robotic bee – the “RoboBee” – from Harvard’s Microrobotics Lab, a low-cost compliant grasper from Harvard’s BioRobotics Lab, and a teleoperated drawing robot self-assembly kit for schools from narwhalEdu. 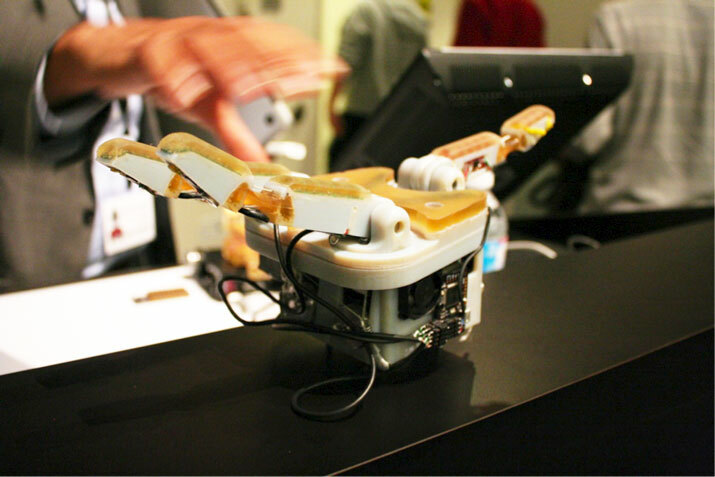 A prototype of the i-HY dextrous manipulator from Harvard’s Biorobotics Lab. Photo credit: Kirstin Hagelskjær Petersen. The technical program was concluded by Prof. Rob Howe from the Harvard School of Engineering and Applied Sciences and the Wyss Institute, who presented on some of the real-world challenges facing the design of robotic hands and manipulators. Since founding Harvard’s BioRobotics Lab in 1990, Prof. Howe has been at the leading edge of research on the roles of sensing and mechanical design for motor control, in both humans and robots. Some of the more lighthearted lessons learned from Prof. Howe’s presentation were that compliant manipulators can make very good t-ball tees, and that lobsters are great to study in the lab because they’re delicious. shows that the colloquium is growing into one of the most accessible interfaces between students, industry, and leading academics for roboticists in the region. As the organizing committee for this year’s edition, we would like to thank our speakers, sponsors, and presenters for participating and we encourage everyone to be involved again next year when NERC travels to Brown University! 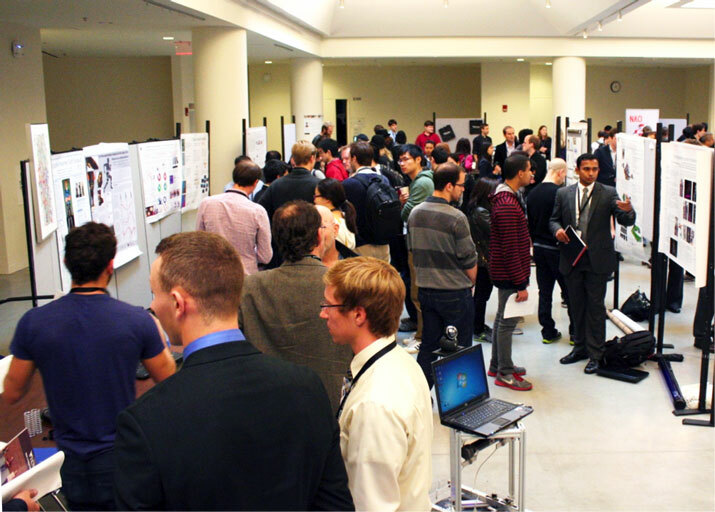 Posters, robots, and industry exhibits during one of the interactive sessions. Photo credit: Kirstin Hagelskjær Petersen.